“Schools are good in Sweden and I want my sons to grow up in safe environment where they can get a good education.” In one of the border crossings in Tovarnik, we meet Syrian refugee Akram. He speaks perfect Croatian after studying here 30 years ago. He is going with his two youngest sons to join family in Sweden. They’re part of the over 100,000 exodus of refugees who have passed the Croatian border in the last two weeks after travelling through Turkey, Greece, FYR of Macedonia and Serbia. Everyone has a unique story. Some are tragic, some are sad. They desire something safer and better for themselves and their families. All have left behind the life they knew. They don’t know what the next day will bring on their perilous journey to the “promised land” of Western European or Scandinavian countries. Akram said that refugees are well informed on every path on their way since they communicate with other groups who have already reached their desired destinations as well as with those who are yet to come. “Croatia is one of the rare places where we don’t have to pay for food, water or transportation and we are thankful for your kindness and generosity,” he said as he was getting onto a bus which will take him and his two sons from the transit camp in Opatovac toward the border crossing with Hungary. The influx of refugees into Croatia started 16 September 2015. Caritas Croatia in partnership with diocesan Caritas affected by the crisis has been involved in the humanitarian response from the first day. We have launched a public campaign, organised in kind donations to be delivered to reception and transfer centres, mobilised volunteers and more. The refugees enter into Croatia from Serbia mostly in Tovarnik and Bapska. After arriving, they’re transported to the Opatovac camp. There they are registered and offered shelter in tents before being transferred towards Hungary by bus or train. In the camp they have medical help, they get food, water, tea and hygiene packages. Special attention is given to the most vulnerable groups – women with babies and small children, the handicapped, the elderly and the sick. Caritas volunteers from the parish in Bapska are working at the border crossing. There they provide warm clothes, bread and jam, food packages, biscuits, water and tea. Tea is very much appreciated in this cold weather. Many of the refugees have been on the road for weeks and hot tea is something they haven’t had for a long time. With the colder weather, rain and snow approaching, we are preparing for winterisation in the camps of Opatovac, Beli Manastir and Čepin. This is not easy because the situation is very fluid. It’s difficult to assess needs and to coordinate with other humanitarian organisations. In the Opatovac camp, Caritas volunteers work in 8 hour shifts 24/7. Since food is distributed during the day and the night there is always a lot to do. The night shifts are very demanding since the biggest number of refugees come during the night. 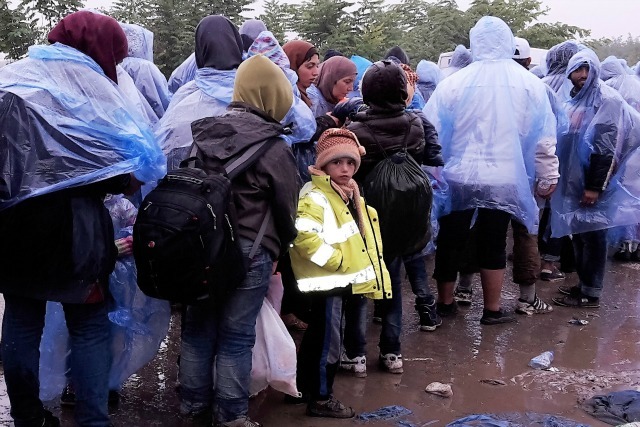 Caritas has launched an emergency appeal for €250,000 (US$280,000) to help refugees and migrants who are in reception centres and transit camps in Croatia.